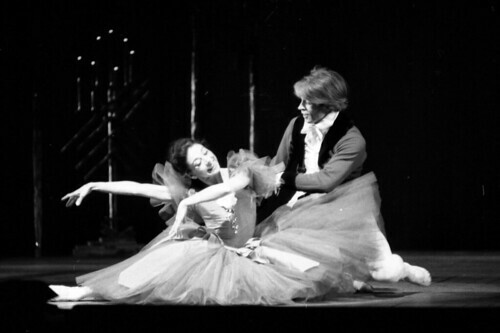 Marguerite and Armand is a sumptuous one-act ballet created in 1963 by Frederick Ashton for Margot Fonteyn and Rudolf Nureyev. 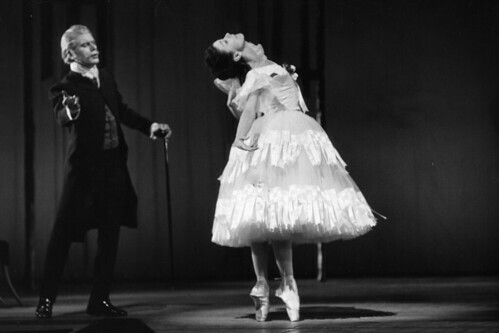 It was praised by The Times at its premiere for its hallucinatory quality and sense of flying passion – as well as for Ashton’s talent, and the hectic grace of the work. 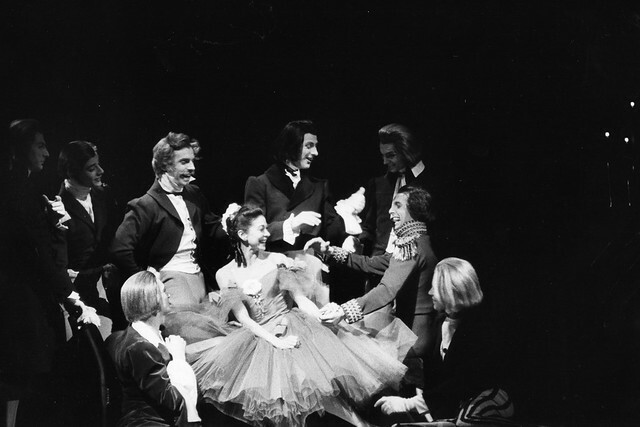 While the chemistry between the lead characters and the devastating narrative have ensured the ballet’s enduring popularity, we can also examine the minute changes in the costumes and designs to gain an insight into the development of this well-loved work through the years. 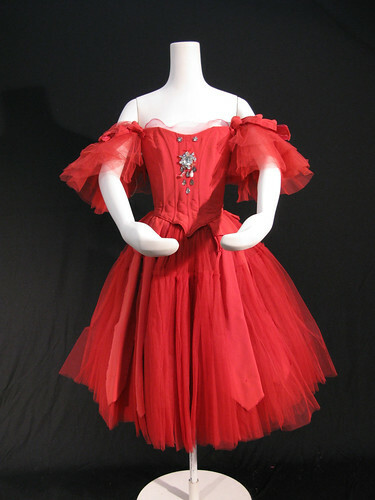 ROH Collections holds some of the original costumes designed by Cecil Beaton and worn by Fonteyn and Nureyev. 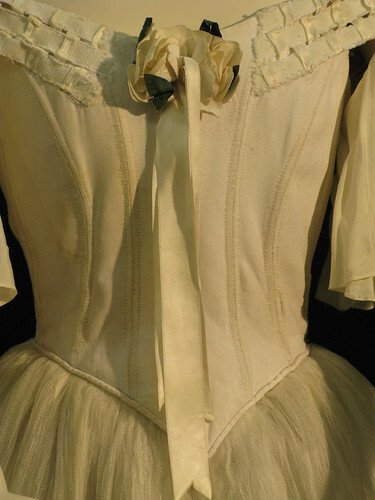 We’ve also recently acquired a complete set of costumes worn by Sylvie Guillem when she danced the role of Marguerite between 2000 and 2005. The costumes themselves are beautiful, but the number of details squeezed into such a short work is astounding: in just 35 minutes Marguerite has no fewer than four different costumes. 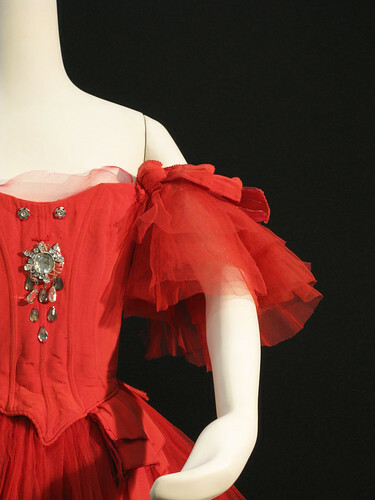 The acquisition of Guillem’s costumes allows us to see the variations in material and design that have occurred over the years, often coming as responses to the preferences of the dancers. 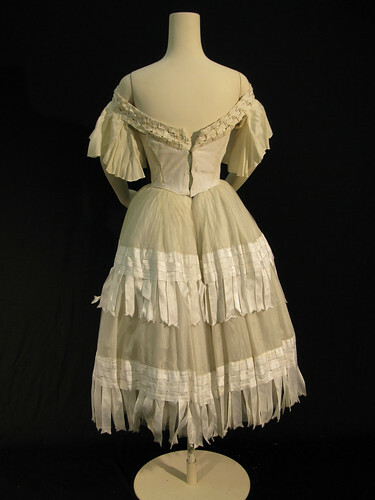 Cecil Beaton’s designs for the costumes were classic in their Victorian style. 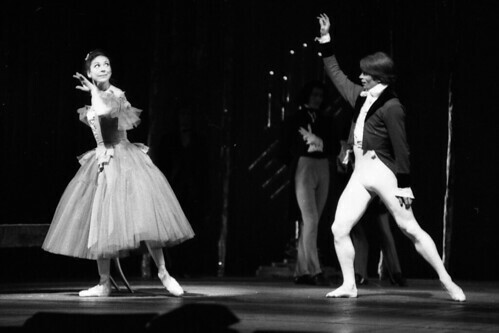 However, Beaton wrote in his diary that he ‘could have kicked her’ when Fonteyn coyly refused to wear red camellias (a device from the novel that inspired the ballet, where the courtesan Marguerite used coloured camellias to indicate when she had her period). 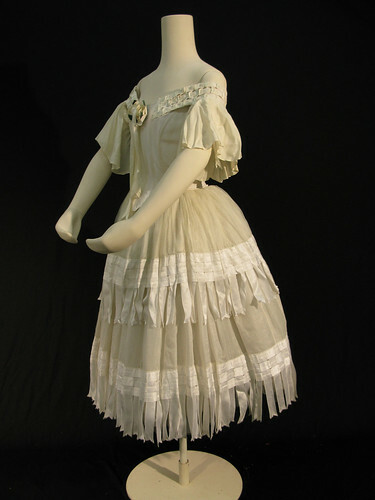 Developments in textiles and fashion played a role too. 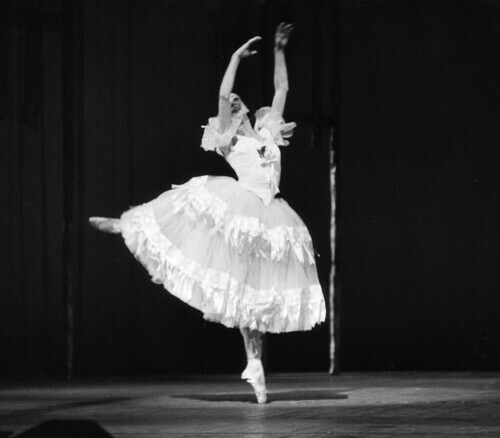 This is seen most clearly in the sleeves for the black costume worn in the third scene: Fonteyn’s costume has striking cream and black tulle stand-up frills following Beaton’s classic Victorian-themed designs, whereas Guillem’s has much more demure and puffy short sleeves. 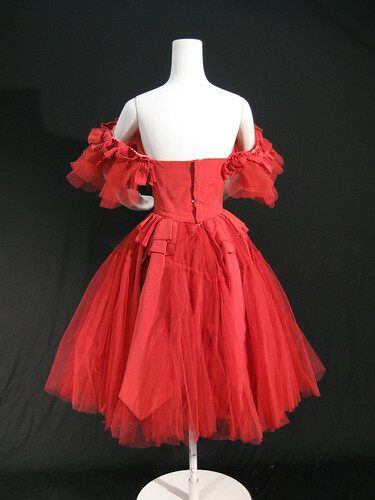 Similarly, Guillem’s red dress from the first scene has top layers of organza instead of the nylon net that Fonteyn wore – a change that affects how the dress moves. It’s not just the costumes that have undergone revision. 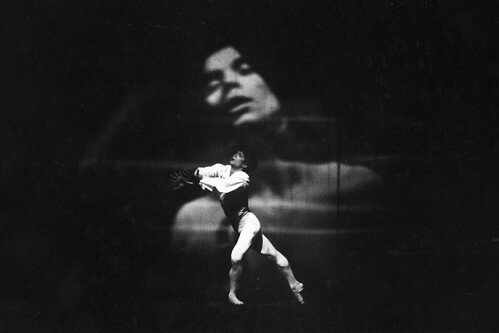 Beaton originally projected large pictures of Fonteyn and Nureyev against the back wall of his set – and drew criticism for it, accused of making gimmicky use of new technology, and of reinforcing the idea that the ballet was purely a star vehicle. 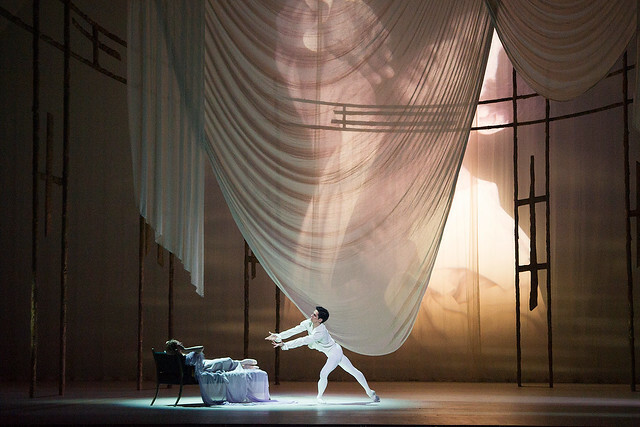 The projections were removed for later performances, but the technology is not so gimmicky today and now the projections, using images of the performing dancers, are integral to the ballet’s character. Some other elements of Beaton’s lavish designs have remained consistent throughout, such as the rounded, gilded cage that reflects how Marguerite is trapped by her own way of life. Clive Barnes wrote that Marguerite and Armand was a far wilder piece than anything that had come before it. Ashton aimed for something that went beyond classicism, which was achieved through his passionate choreography, but also through Beaton’s luxurious designs. The same intensity and excitement can still be experienced by audiences at the Royal Opera House more than 54 years later – and items in ROH Collections allow us to study and document the changes that give this and other works life and breath many years after their first performances. The Dream / Symphonic Variations / Marguerite and Armand runs 2–10 June 2017. Tickets are sold out, but returns may become available.